On last week's chat ../ning/05ju2010.htm there is a picture of a dark orb. ZT states it is PX and that "the dust cloud is not allowing sunlight through." Looking back at the 2009 images of the second sun at ../newsletr/issue132.htm ZT states that, "The light reflected off the Planet X complex, which includes its immense dust cloud, is as bright as the Sun, when it appears, because it is sunlight, deflected." Would the Zetas please explain why sometimes PX's dust cloud reflects sunlight and at other times it doesn't? Here is a simple experiment, which will clarify this for you. Take a mirror off the wall where it hangs, and place it in the center of the room. Place a light behind it, a lamp light. Now face the mirror and note that rather than reflecting the light from the lamp, the mirror is blocking the light. This is what Planet X does when the line of sight in not correct for a reflection. It blocks sunlight, and the relative size of the orb in the photo you reference shows the relative size of Planet X surrounded by dust. This altogether is not a small size! Now turn the mirror to the side, and move it slightly to one side so it reflects the light directly into your eyes. Suddenly, you must shield your eyes from the light! The reflected light is equivalent to the lamp light itself. This is what happens when Planet X and its massive dust cloud are positioned to the side sufficiently so that reflection of sunlight can occur. It is as though you were looking at the Sun itself, in those moments, which is why such a reflection is called the Second Sun. The Zetas have explained, often it is a Moon-Swirl of PX on Nasa-SOHO, sometimes PX itself. Appearance similarly. Why is to be seen in each case always only 1 of it? Never 2 of it in a picture. Always only by chance one? Why not by chance also sometimes 2 or more Moon-Swirls or PX + Moon-Swirl on same picture? [and from another] Why Moon Swirls of Planet X are themselves the tail, as the Planet X? And why when the Moon Swirls is visible, not visible Planet X itself? The tail of Planet X is vast. When Planet X arrived in the inner solar system from the direction of Orion in April, 2003, it was not on the same side of the Sun as Earth, was charging toward the Sun, dragging its tail behind it. In April, 2003 Planet X was still being photographed in the night sky. Yet as Planet X put on the brakes and slowed to a creep when encountering the Sun, the charged dust cloud wafted forward to cause outages on Earth. In August and September, 2003 New York City went dark, and the Yucatan and Sidney, Australia likewise went dark. These outages were due to surges which caused the electrical systems to shut down. Brilliant Second Sun sightings occurred at that time because Planet X was far enough to the side, in the view from Earth, to allow this reflection. Compute the distances. Earth halted in her orbit in December, 2003, encountering Planet X in her path. By August and September Earth was 4 month away from Planet X, 1/3 the distance of her orbit. Yet the charged tail had reached the Earth, such is the size of this tail. When not traveling in space, on the move, the charged dust cloud is blown out from the magnetic N Pole of Planet X. The Moons are never more than 5 million miles from Planet X, though dust and debris are further out. Thus, the many fireballs that Earth is experiencing these past years. Should Planet X and many of its Moon Swirls logically be in the same view from SOHO or the Stereo satellites? Yes, but not all create a reflection, nor do all reflect at the same time. Primarily, sunlight reflects back to the Sun, or bounces at an angle to head away from Earth and her imaging satellites. The angle has to be such that a wide angle is taken, to send sunlight off the dust clouds thence to Earth. This is why you only see part of the cast, though the stage has them all. The Chinese government must be know the pole shift will take place long time ago, and when that time all the water power dam would be destroyed. Why did the Chinese goverment still spend 95.46 billion yuan in building the Three Gorges Project from 14th, December, 1994 to 20th, May, 2006. The Three Gorges Dam could be used in less than 6 years until the pole shift. Beside, this Dam has brought a series of problems such as climatic anomaly in the southwest of China, worsening water pollution, landslide around the river. Part of the reason the major heads of state around the world are participating in the cover-up over the presence of Planet X is that there is no certainty, in their minds, about the outcome. Perhaps it will be as devastating as ZetaTalk describes, or perhaps the passage will occur with nothing worse than high tides and a few earthquakes. The specter of a rioting public, refusing to attend to their jobs, or total chaos with millions killed and all semblance of order or progress in building economies lost in the process. What do those in power in governments desire? Control, a rising economy under their direction, and placid workers. Thus, they prefer to proceed as though all would be normal, or virtually so, and certainly their perch on top of the pile not disturbed by any pending Earth changes. For the European tsunami, there will be a large void, a spreading apart, not rising or falling land on either side of the fault line. When water rushes in, it will clash in the center of the rift, and rise up. Thus, undecided in what direction it wishes to go, it will be very subject to the existing Gulf Stream, which will propel the excess water pressure in that direction. The Gulf Stream does not go directly into the mouth of the Mediterranean, which in any case could absorb a tsunami impact and dispel it quickly. Th Gulf Stream tends to curl in two directions: curling round in a circular motion back upon itself and heading north toward Britain. Where it curls upon itself, the bulk of the tsunami there will return to the rift again, and settle, not causing any perceptible high tides along the African coast or in the Caribbean. Hello Star Ancestors, I am very emotional to alot of my people who are in the main STO in Central Southern and Eastern Polynesia will die because we will be hit by huge giant waves. I see we are not covered in the safe locations. What is your recommendation if my people ask me where to go? Another thing I noticed landmasses on maps before and after the shift, is that the nothern hemisphere now seem to have more land mass, the southern has less. Will this be the case for central, eastern south pacific after the shift? Will we see more land gained since we will be shifted to the northern side of the equator like Hawaii is now? Or is the compression of the pacific bowing up or downwards pulling us further into the deep pacific? The Pacific Plate is assumed to be a single plate, but it is not. Hawaii, which rides higher after every major adjustment in the area, is rising, and this can only be the case if there is subduction of a plate somewhere, pushing the plate that Hawaii rides on up. 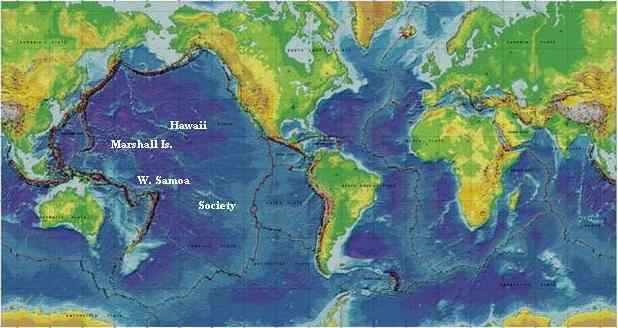 The Society Island are on a chain that forms a line with the Hawaii Islands, and such a rise is not a coincidence. This is also a fault line, where a plate that is subducting under the Americas is rising commensurately along these island chains. There is a fault line running from Kamchatka to the Society Islands, and both will rise during the pole shift. There is likewise a fault line running from just west of the Hawaiian Island chain down to West Samoa. West Samoa shares the Indo-Australian Plate edge with New Zealand, and will rise, and significantly so. New Zealand is expected to rise a total of 500 feet during the pole shift, which will essentially offset the 675 foot rise in sea level expected worldwide within two years after the pole shift. Thus, the islands of West Samoa can anticipate being, in the main, above the waves. There is likewise a portion of the Pacific Plate pushing under Japan and forcing the Philippine Plate to dive under Indonesia. This is tipping this part of the Pacific Plate so that the Marshall Islands and parts to the southwest of those islands are rising. These islands will benefit from the pole shift, though will not gain the altitude that West Samoa will. You've said in the past that higher density entities of different races all coordinate their efforts and split up the work load in an organized manner. I'm wondering if higher density entities like the Zetas, in addition, coordinate their efforts and work plans with the many disembodied spirits attending earth at this time. Many contactees are conferring soul-to-soul during their visitations, and thus are puzzled because they cannot dredge up any recall of being on space ships or meeting aliens. Yet the soul is aware, and updates the mind of the contactee, the brain matter, promptly. Highly spiritually mature disincarnate spirits are of great value during a Transformation, as they can answer the Call without disrupting the life of the contactee, and do not require missing time. Contactees with reluctance to get on a ship or meet an alien will respond to a soul-to-soul conference readily, also. We, the Service-to-Other Zetas in 4th density, are more in touch with our souls and less encumbered by our physical bodies, so have soul-to-soul conferences with each other often. Telepathy is another route we use, of course, but soul-to-soul is just as fast if not faster, and need not disrupt the physical body which might be hard at work on an important task. The physical body, the mind, is updated later. During Transformation activities disincarnate spirits working as part of the team simply use this route to communicate with us. It is no different than receiving a phone call from a co-worker. They are not physically there, but communication occurs. Can the Zetas please explain why we need to protect our garden soil from volcanic and cosmic fall-out but non-distilled surface water is okay for watering the vegetables? [and from another] Studies have been done on heavy metal absorption by plants in Hungary, China, and India. The latter study of irrigation and rice production from very polluted water shows that heavy metals do get absorbed into plants. Vegetation will absorb heavy metals, often to a degree that surpasses its presence in the soil. Some plants are used to decontaminate soil, in this regard, as they are known to pull the pollutants from the soil. The reason we advise to distill drinking and cooking water but have not mentioned doing so for gardens is because of the burden, at least the perceived burden. It's a matter of psychology. If you tell someone they must brush their teeth daily, you get cooperation, but if you told them this should be done every 5 minutes, you get rebellion or a sense of hopelessness. The advice is shut out, and the teeth not brushed at all because the whole issues seems overbearing, a goal impossible to meet. What should also be realized is that such polluted soil is rare, and is only in locations where industrial wastes have accumulated. Volcanic ash will not pollute the soil in this way, but it will temporarily pollute the ground water. Fluoride on grass will kill grazing cows after a volcanic eruption, but will not pollute the grasslands long term. It is a surface powdering that is poisonous, and for only a short time until rain water washes it off. Likewise lead will rise from underground, in cracks in the ground, after the shift, pushed up from the magma, so will pollute well water on occasion. This settles back down within years, in those locations where this has occurred, but distilling drinking and cooking water will protect you, as lead is not visible in water. Fish will pick up mercury, but not lead, in those waters where mercury poisoning from industrial wastes are known. Heavy metals in volcanic ash on the ground will be picked up first by rain, flushing into the local surface water and ponds. Thus water, taken directly into the body by drinking water, is the most likely and dangerous route. These same heavy metals flushed into the ground can be taken up by plants, but since the flushing will occur quickly, and root and stem development takes a long time, this moment is past quickly. You drink faster than a plant can absorb, is what we are saying. A glass of water is quickly in your system, but a plant will not absorb a glass of water in a moment, nor even over several days. There have been (officially) 2000+ nuclear tests (many of them underground) conducted around the world by various nations since 1945: http://en.wikipedia.org/wiki/List_of_nuclear_tests Can the Zetas say what effect these tests have had on the geology of the test site areas, and whether this is any cause for concern during the Shift for people in those areas, due to weakening of the ground structures or release of buried radioactive particles? These are local impacts that at most break some surface rock. Plates go miles deep, and have many rock fingers across their fault lines, so such a tiny spot on the surface, or even a tiny place where rock fingers or layers may have been broken, is insignificant. A more serious problem may be radioactivity in the area, but when this is present it is known, and the area cordoned off with signs. A simple question in regards to compass. After PS and earth crusts settle into their respective place will our today's compasss still pointing to the correct direction as indicated in the compass? Will it's N point to the new North Pole etc.? Your Sun is your solar system's main compass, pointing to magnetic North and South. As we have explained, and NASA's Ulysses probe has demonstrated, the Sun does not flip its poles every 11 years or so, though NASA continues to claim otherwise, too embarrassed to admit they were wrong. Mercury and Earth point in the same direction, lining up side by side with the Sun in this regard. After the pole shift, the core of the Earth rights itself to again be in alignment with the Sun. The crust remains where it has landed, as it has during prior pole shifts, and thus the crust shows a pattern of wandering poles on the surface of the Earth. It takes several weeks for the core of the Earth to right itself and for the Earth's magnetic field to re-establish itself, but then the compass should start to point North clearly and consistently. This will be erratic at times for some years, however. Thus, your compass will point to the new magnetic N Pole. And your old familiar star systems will once again likewise be your guide, albeit with some minor adjustments as the new geographic and magnetic poles will be more closely aligned after this pole shift. To completely understand the confusion associated with the Moon Swirls, and the body of Planet X. How distinguish Moon Swirls and itself Planet X on the images SOHO/STEREO? So, all that we saw earlier in the pictures SOHO/STEREO is only a swirl of moons? Are there any general satellite image of the planet X? The Winged Globe and Red Cross are the body of Planet X, identified primarily by position in the lower right hand side of the Sun on SOHO and Stereo images. Where there is a String of Pearls this is clearly a Moon Swirl seen from the side. The primary reason for confusion is that most of the visibility is due to the dust cloud, which reflects sunlight. This is true whether the dust is shrouding the corpus, Planet X itself, or a Moon Swirl. Both have drifting debris, the drifting tail so often noted. Both have a blaze of light. Planet X itself has two primary Moon Swirls that flare out on either side, like shoulder pads. This is the source of the Winged Globe shape, and the double helix shape on some photos of Planet X. These Moon Swirls keep apart from each other, though compete to be the closest Moon Swirl to the body of Planet X itself. Fairly equal in mass, they both cling close to the body of Planet X and both refuse to be displaced, thus the wings. The Checkmark shape is due to a similar arrangement coming from a single moon. When seen, this is clearly not the body of Planet X, but a Moon Swirl arrangement. This article (Christmas Hammer, ../index/zeta420.htm) speaks about a "wakeup call" for the inhabitants of planet Earth, "A major adjustment.. unleashing a series of great quakes", caused by "increasingly violent daily lurch" jerking the Earth's plates. Is this a description of Plate Movements associated with a move to a "7" and during the "8" of 10? This ZetaTalk, written in late December, 2007 indeed describes what the holographic presentation that Nancy attended in November, 2009 was intending to relay. We have confirmed that some of these incidents will be part of a movement to the 7 of 10 stage, and by the end of 2010. In that we have also confirmed that burning oil fields in Iraq, caused by the rolling of the Arabian Plate, will be part of an 8 of 10, our 2007 ZetaTalk was also speaking of this point in time. 2. Everywhere you looked stems were broken at the very base of the plant - no bent stem found. [and from another] http://www.cropcircleconnector.com/2010/Yarnbury/comments.html A similar pictogram appearing in the past at Lockeridge, near Avebury, Wiltshire. Reported 6th August 1998. We have pointed out that a hoax can often be identified by being small (so the hoax can be accomplished in a short time) and full of straight lines (as these are easier for man to lay out). Obviously, broken rather and gently bent grain is a big clue too. The small keyhole laid at Yarnbury Castel is a hoax, as was quickly identified on May 16, but CropCircleConnector changed its tune because many argued the case that there were similarities to a 1998 case. 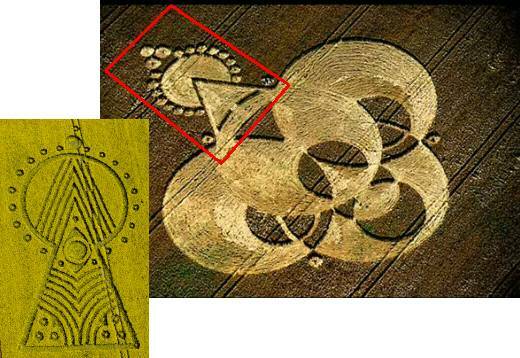 Those doing analysis on crop circles are many, and many strong egos are involved. Thus, arguments sway in all directions as to what the official determination should be. The Zeta's have stated that the Great Lakes will slosh. That it is a given based on Shift movement, but not to the violent degree of the oceans. Will there be a higher depth of 'slosh' based on the direction of the Earth movement? In other words, can certain areas around the boundaries of the Great Lakes expect higher slosh waves than other areas? For example we believe the first slosh wave will be in coming onto the South Eastern shores and then back slosh on the North Western side, based on the Northwest movement of the Earth in Shift mode. Will this sloshing be more severe to the Southeast with first wave? If we are correct the first slosh will affect lower West Michigan and the Eastern Gary, Indiana and Chicago region. Could People living on the Green Bay Peninsula be in jeopardy? Will Lake Superior slosh right over the isthmus separating Lake Superior and Lake Michigan? Will the Lake Michigan slosh wave continue on into, close to shore lakes, like Lake Charlevoix? If this is the case, what height in wave slosh action can be expected on the far end of Lake Charlevoix's South Arm? Depending on the time of the Shift event, will determine how many people with summer homes on the shore lines will lie in danger. Will the Lake Huron slosh be involved with the tearing of the St. Laurence Seaway? How will the 'thumb' of Michigan fair? How will the Keweenaw Peninsula fair? We have stated that as a general guide, those living along the Great Lakes should be 100 miles from the shoreline and 50 feet above the level of the lakes for safety. Thus, no great sloshing of the Great Lakes is expected, such as washing over the state of Michigan. During the hour of the shift, when the entire globe is on the move, and rapidly so, water will of course pile up on the southern shores first, and will likely not slosh back onto the northern shores until after the hour of the pole shift. Residents along the shorelines should go inland to safety until a day or so has passed, to avoid being lured out onto a shoreline temporarily without water. Water may draw away from the shore, but will be roaring back again, and at above normal heights. The tearing of the Seaway will, if anything, relieve the worry, as the water in the Great Lakes affected will have a void to fill. All the locks between the Great Lakes will tear open, allowing the water at higher elevations to flow freely, but the wider Seaway will absorb this increased flow. Our advice to all those who might be in a danger zone is to leave their homes, returning only after the danger of the pole shift is past. Everyone is monitoring the number of earthquakes but most are at the upper crust. The plates themselves go down to a depth of 400km per today's science and it would seem to me that we should be more concerned about the deeper movements where the lithosphere and the asthensphere are adjacent to each other. If the whole crust is moving then the major events would lie below the lithosphere. Shouldn't we be focused on monitoring the depth of the movement rather than just the volume of quakes? Or is it that the entire mantle will move over the inner core? The mantle including the inner mantle goes down to 2700 km. For reference: http://www.enchantedlearning.com/subjects/astronomy/planets/earth/Inside.shtml "Mantle: Under the crust is the rocky mantle, which is composed of silicon, oxygen, magnesium, iron, aluminum, and calcium. The upper mantle is rigid and is part of the lithosphere (together with the crust). The lower mantle flows slowly, at a rate of a few centimeters per year. The asthenosphere is a part of the upper mantle that exhibits plastic properties. It is located below the lithosphere (the crust and upper mantle), between about 100 and 250 kilometers deep." It is primarily the ability of the rock fingers along fault lines that prevent the plates from moving. As we have mentioned, these rock fingers have been broken off, in the main, by the repeated lurching of the globe during the Earth wobble. It is not until the hour of the pole shift that the grip the core has on the crust is broken. Even during the severe wobble, the globe turning almost upside down as a result of tipping away into the 3 days of darkness, the core and crust do not release their grip on one another. It is the speed of the shift, with Planet X moving rapidly overhead, that causes this tearing, and thus the core floats back into place while the crust remains where it has arrived. Man is not attuned to deeper jolts in the mantle, because these either do not occur or do not result in surface changes. NASA has planned for decades to use the Sun as an excuse for the Earth changes anticipated to be caused by Planet X. As far back as the last solar maximum in 2002 it was announced that this cycle would be so much worse. Then the Sun went to sleep as Planet X began pointing its magnetic S Pole at the Sun, quieting the sunspot activity, which are inherently magnetic, because the S Pole is an intake for magnetons. A near record of 260 days without a sunpot occurred. Nevertheless, rigid and unable to change their plans, NASA released news articles in 2009 on schedule talking about how horrific things could become. This, despite the low CME activity, which is extremely mild for a solar cycle just a year or so from the projected solar maximum. Now more fear mongering, all based on pure speculation, and predicated on the assumption that this solar cycle, which they have conveniently pushed to line up with 2012, will be the worst imaginable. Unfortunately for them, solar cycles do not cause an Earth wobble, nor have they ever, in man's history, caused earthquakes or plate movement. And when the anticipated signs in the sky increase to the point where the public will no longer be fooled, NASA will bear the brunt of being the authors of a long running lie designed to keep the public in the dark. I saw the new movie Splice, where they create a hybrid human with other animal species. Is this similar to the experiments in Atlantis? And are hybrid programs like the Human/Zeta common or uncommon in the universe? This is entirely fiction, as any geneticist knows. Disparate animal species cannot just be stitched together and thence share a blood system! The blood from one would consider the blood from the other foreign, and attack. Humans cannot receive transplants from other humans without immune suppressant preventing the human from killing off the transplant. Should such a Frankenstein Monster be attempted, with immune suppressants, the nerves from whatever head was retained could not communicate with the foreign tissue, which would lie limp and ultimately die, rotting from within. 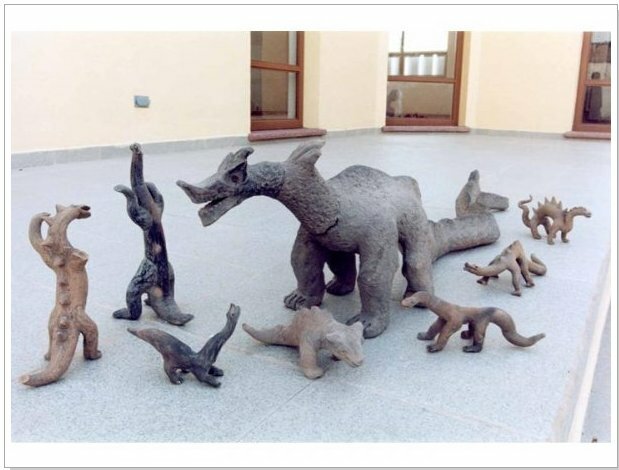 Genetic engineering requires first that compatible animal species are located, with careful selection of the gene pool such that a single creature emerges from the ova on out. Not by splicing pieces together. Such a maneuver would never result in perpetration of a hybrid, obviously. If Pole Shift occurs the way the Zetas predicted, 1 or 2 billions of reincarnating souls will experience physical death at the same time, probably a strange and unprecedented situation for the entities of Planet Earth (and for the Spirit / Birthing Guides as well). In the body of ZT (When we die) there's a famous reference to a"reception line awaiting them (souls) when they die, from the reports of Near Death Experiences - a long tunnel with a bright white light at the end, and those now deceased who were close to them waiting or beckoning". Are souls coming from the same families, close friends and lovers, will they go together through the tunnel into the Light and live there until time comes for their next incarnation? Indeed, the anticipated dieoff during the pole shift and during the weeks following is one reason the Earth has such attendance from disincarnate as well as incarnated entities at present. There is at least one visitor in attendance for every incarnating soul that has evolved on Earth. Nevertheless, herding young souls in the direction they need to go, between lives, is not as simple as pointing a finger or a tentacle. Group activities that are engrossing to all the newly released spirits are thus a very practical way of handling the temporary chaos. In normal times, more than one Spirit Guide is in attendance at a death, to fetch other spirits with whom the dying one might have had issues or who could help with the transition, and to counsel those in attendance during the transition. After the pole shift, group meetings where a family or several neighboring families who were close during life might be transitioned together, to the extent that they share grief or have open issues. This at a minimum might be a good place to park them, during the rush hour. When looking at maps of the New Madrid Fault complex the fault lines run from the northeast to the southwest. My understanding is that when the New Madrid adjusts and tears that the lands west of the Mississippi will drop in elevation. My 1st question is how far north that drop in elevation will go? Where I live in eastern Iowa is approximately 250-300 miles north of the New Madrid faults yet in the maps of the after times southeastern Iowa appears to have been swallowed by the gulf of Mexico. The second part of my question is; is this due to the drop in elevation or is it due to the eventual rise in ocean levels? Depending upon the answers I will need to relocate sooner than later. Iowa has had flooding along its rivers in 2008 that left much of the state under water, at least temporarily. During the hour of the pole shift, we have predicted that the Mississippi will backwash due to the sloshing in the Gulf to the extent that it will essentially not drain at all. Iowa will have problems with evacuations, thus, even before the sea level rise in the Aftertime reaches 675 feet above sea level. The tearing of the Mississippi during the New Madrid adjustment is not due to distance from the New Madrid area, it is due to the Mississippi lying along a weak point in the plate, where the crust is most thin and thus this is where the crust has dropped. This is why rivers are invariably in the stretch zone for an area, as the crust can pull apart most easily there, and has been pulling apart there in the past. The N American continent must adjust in total, as the whole of the continent is being pulled into a bow. It is not just the New Madrid area. However, Iowa will not be flooded due to the adjustment of the New Madrid, though lands just to the west of the Mississippi may find they have lost elevation. We have stated that static electricity will be generated by the friction of the charged tail of Planet X against the Earth during the last weeks, and that this will result in what the ancients described as trumpeting from the skies, a type of thunder when the lightning leaves the Earth's upper atmosphere on its way to Planet X. Except for the point where it leaves the Earth's upper atmosphere, or the point where it arrives at Planet X, this lightning moves silently and invisibly. But in the upper atmosphere of Earth would not take the form that traditional lightning passing from sky to Earth assumes. There, a sudden snaking down to Earth occurs, the pathway lit for a moment, followed by the thunderclap. Upper atmosphere lightning has less to interact with, no hydrogen or oxygen or other components to fuse or split, so it lacks the flash of light. But there is a point of connection where an electrical discharge is accumulating in Earth's upper atmosphere to a point in space which this discharge can use as a route for grounding on Planet X. When that connection is made, what is the appearance from Earth? 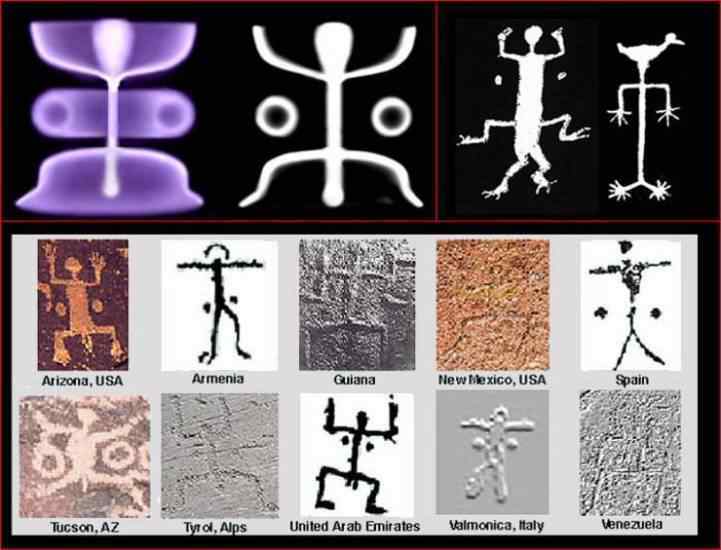 As these clever scientists have shown, a laboratory plasma discharge takes the appearance of ancient petroglyphs, worldwide. This is not a clash of Venus or the Dark Twin that creates such displays, but rather the drama that close contact with Planet X during the last weeks presents. Major headline today on Fox News website: Nuclear physicist, Stanton Freidman, says UFO coverup is a "Cosmic Watergate". This is not someone or something new from Freidman, who is just another C2C UFO guy, and now all of a sudden it's a big revelation from a Nuclear Physicist? Is Murdoch being used to start disclosure? The Fox News base is so conservative, so strongly connected to the religious right, that any discussion of UFOs or the alien presence would be immediately discounted as fanciful. Such a news cast would be considered, by the majority of the Fox audience, as light comedy inserted into the heavy news of the day. Murdoch, however, knows the truth about many matters and knows that disclosure is coming. To avoid being sidelined when the news finally breaks, he has lined up the most conservative UFO reporter, physicist Stanton Freidman. The topic will be treated in a serious manner, with solid proof discussed amid solid debunking of the many hoaxes that have been foisted on the public over the years. This article notes the presence of tar balls in the Florida Keys that have no relation to the oil spill in the Gulf. Additionally, reports of oil balls in Louisiana have also recently surfaced. They, too, apparently have no relationship to the Gulf oil spill, suggesting that oil is leaking from other sources. http://news.blogs.cnn.com/2010/05/19/coast-guard-tar-balls-on-florida-keys-not-from-gulf-oil-spill/ Now this article comes out. http://rawstory.com/rs/2010/0608/coast-guard-probe-report-gulf-spill-official/ Is this why the press and scientists have been limited in their attempt to investigate the spill? We have explained, since the start of the BP oil spill, that the difficulty in capping this well has been the excessive pressure in the pool of oil tapped. This comes from the tightening bow the N American continent is under, wherein the Aleutian Islands are being pulled toward the tip of Mexico as the Atlantic spreads apart more at the Equator than it does toward the poles. This eventually will result in a major adjustment in the New Madrid, causing Mexico to shift west while the East Coast of the US remains in place. This slip-slide quake will relieve the pressure on underground oil pools, but until this time oil drilling in the Gulf remains risky. Existing wells will and are experiencing excessive pressure, and the BP well will only come under control as the pressure in that particular pool of oil and gas is eased. In part, this is not being explained to the public because they don't want questions on why oil pools are suddenly under pressure. This, combined with sinkholes and oil and gas well explosions elsewhere in N America and the world could open up a wider discussion on the weather and tides, when the establishment is claiming all is normal. Thus, delayed reporting on the issue. Sample No. 3: (I-4031) 3060 + - 120 (C. 1110 B.C.)" Dinosaurs live with man today, in the outback deserts of Australia where large lizards running on rear legs have been sighted, in the rivers of Australia where something akin to Nessie has been sighted, and of course in Scotland where Nessie lives. Extinct fish are occasionally raised from the deep, and the crocodile and cockroach are just as old. What qualifies as extinction is in the mind and memory of man, and modern man has decided that large creatures such as monstrously large lizards could not possibly be sharing their Earth. Such a scary thought! Thus, as the possibility has been discarded, for the sake of comfort, the evidence must be discarded too. Did dinosaurs live in this remote desert area of Mexico as recently as 3,600 years ago, or the multiple, 7,200 years ago? The mammoth died out only 3,600 years ago on islands now in the Arctic circle, so indeed, quite possible. During every pole shift, there are climate changes, with surviving animals migrating afterwards to locales where the new climate and food sources suited them. The remaining mammoths were thrust into a region so cold and inhospitable that they did not manage to migrate before dying out. The Acámbaro region was not the desert it is today, in the past. Lush, it supported dinosaurs which had been pushed to this region by changes in the surrounding terrain. When this enclave suddenly became desert, they died out, but are recorded for history by the artwork of the native peoples of that time. We have explained, during various stages in the dance between Planet X and the Earth, that there is a dither and a jiggle going on. Planet X moves forward, outbound from the Sun, ever squeezing the Earth and the Dark Twin and Venus in its path. It has turned its N Pole outward, away from the Sun, but depending upon the strength of any other magnetic field it encounters, will jiggle in this regard, pointing a bit this way or that. Thus the Earth may find itself in the grip of the magnetic field of Planet X, losing its S Pole, or being pressed into a side by side arrangement, or relatively at peace. But any quiet time will be short lived as the outcome in inevitable. The Earth tries to escape the monster bearing down on her. She crowds to the left, away from the direction from which Planet X is approaching. Here she is limited as she is trapped in an ever tightening eddy flow cup. Her ability to move is also affected by the Dark Twin, to her left but now falling behind her. At play in this issue is particle flow crowding, the planets moving to that area least crowded, and this changes as everything bobbles about. What is inevitable is that Planet X will pass overhead, causing a pole shift on Earth. What is inevitable is that the Dark Twin and Venus will be squeezed closer to the Earth and then will escape the cup. What is inevitable is that the Earth will no longer be able to evade Planet X by backing up in her orbit to the left, but will be in front of Planet X and thus receive the full brunt of the hosing of magnetic particles hosing out from the N Pole of Planet X. Thus, the steps resulting in the 3 days of darkness, etc. During this dance, there will be occasional stages when the pressure and resulting Earth changes seem to ease. Or where Planet X is less directly in view in the narrow scope that the SOHO or Stereo satellites view, or where Planet X is so directly in view that there is no sunlight bounce off the dust cloud and it likewise disappears from view. Think of the overall trend, and your preparations to help others during the cataclysms that will inevitably arrive, rather than focusing on the footsteps of the dancing partners. I live in the middle of Norway and my father lives approximately at the Polar circle, also in Norway, and near the coastline. What we both have seen this spring and start of summer, is that there is almost no seagulls. At normal years we have more than enough seagulls, so it is easy to see and hear that we are missing a lot of them. Is this due to the shift we are going into, and that the birds know there is no point in laying eggs this year? Nancy could tell you that seagulls have appeared inland in her native Wisconsin, but only in these past few years. They may have migrated inland by accompanying ships coming in via the Seaway, but as these are saltwater birds, why move inland along fresh waterways? They appear in fields that have been freshly plowed, and sit about in shopping malls on the tall light posts. As all animals, birds are guided by many clues as to where the best food lies and where to take up residence. These are subtle clues, and many, and involved a subtle change in smell that indicates more death than life in certain waters, for instance. Animals that can migrate readily are survivors, as the world will be changing radically in the near future, for all. Expect, thus, to see sea gulls in the Aftertime! I heard a fascinating radio feed of a man who is an undercover reporter currently situated on Grand Isle, LA. Allegedly, there is a lot of government watchdog activity mandating a total media shut down in relation to the BP oil incident. He reports people are being arrested if they have cameras, attempting to take pictures, police lines and road blocks to search cars for cameras, and the locals have been warned not to talk to anyone and appear threatened etc. The fear is Marshall Law could be applied any day now. I am wondering if this could possibly be the beginning of the Madrid fault incident starting to take place and it is actually this which the government is trying to keep out of the public eye and knowledge. Do the Zetas have any inside knowledge if this is truth or sensationalism in the report? The government is not trying to save BP from embarrassment, or protect the oil industry, or even save itself from embarrassment by these actions. It is trying to prevent awareness of what is going on in the Gulf in general from becoming a media focus. We are speaking here of the many leaky wells in the Gulf, which have never leaked oil in the past to this degree - established wells, leaking oil suddenly. This is likely, in the eyes of those foisting the cover-up over the presence of Planet X, to lead to connecting the dots, realizing that sinkholes and dropping bridges and unexplained booms are somehow related, which they are. They are at the point of fearing that the public will connect the dots even with media suppression in place. Why is the weather so erratic? Why are the Sun and Moon not in the right place? Why are the constellations not in the right place? All this leads to research on the Internet, which cannot be easily suppressed as it is used for business, and such a shutdown would cripple the economy utterly. Where is this all leading? To a type of disclosure, perhaps ZetaTalk in the media, advising on steps to take for self sufficiency. It will not lead to an open admission by the US government that Planet X is in the vicinity, nor will it lead to martial law. As the cover-up starts to break people are going to be looking for answers. I anticipate this beginning to really take a turn whenever the event happens this year to bring things to a 7. At some point, public interest will become avid enough that ZT followers may find that newpapers (or online blogs?) would publish editorials that aim to educate the local populous about the surviving the poleshift. My thought was that ZT followers could have a role to play in at least educating their local community. I also am wondering if FOX news and the like are going to try and tempt people into turning to government work camps? Is there going to be an 'Information War' in the final hours of the poleshift where the media is blitzed with so many different takes on matters that people don't know who to believe? Is attempting to educate people via newspapers, online sources, or other media sources is going to be an important battle to wage in the final days for ZT followers who are savvy and interested in helping out? The press for Nancy to become a media spokesperson comes from the Puppet Master, who knows her well. He has been told that the information he seeks from ourselves, the Zetas, will not be forthcoming unless the common man is given the same opportunity to receive and process the information. This means an outlet equivalent to a TV interview, broadcast live or nearly so. Were it not for that, those thrust into the media would be spokespersons - for the 2012 scenario or the Planet X hypothesis - with which the establishment is more comfortable. Many names come to mind - Jason Martel, Richard Hoagland, James McCanney, Marshall Masters, and all the authors of 2012 books busy on the lecture circuit. Anyone but Nancy, who reports our words and is not shy to do so despite our contempt for controlling politicians and the greedy wealthy establishment attempting to run the world via their wealth. But it is Nancy who will emerge when the time comes because the Puppet Master has great influence on the media, and in fact owns it in most cases. What might this mean for those who have followed ZetaTalk for years, faithfully? Nancy will be asked who she recommends, as the issue of survivability, survival camps and preparations, will be a hot issue. There are of course numerous websites and books on survival in the wilderness, and how to stock up on supplies. Most sell something. Some websites, such as the Pole Shift ning and the author of the comprehensive material recently put on the web, are not seeking a profit. Not everyone wants to be a public face, and private plans should be held close to the chest, but there are many who will be given an opportunity. This ning is likely to be mined for interviewees, and not just by Nancy. The location of members is a public item, though the email address is not. But media outlets may join the ning simply to get in contact with some of the more vociferous members. Be forwarned! How many meters will Japan rise with Pole shift? Japan will experience an average of a 200 foot rise during the pole shift, but this will vary from the north end of the Japanese islands to the south. Japan lies on the N American continent, a tongue of which protrudes in that direction, encompassing the Aleutian Islands, Japan, and the Kamchatka region. We have stated that this tongue will not break off to become a separate plate, despite all pressure on it. That portion of the Japanese islands closer to the main plate, to the north, will remain further above the waves after the shift, due to rising with the main N American plate which will ride over the Pacific plates. Due to the crumbling of the Philippine Plate, the region near the southern part of the Japanese islands does not get pushed up as far, as that which would subduct under southern Japan finds an easier path through the crumble. Thus, northern Japan might find land rising 250 in elevation, while southern Japan experiences a 150 rise in elevation. Will the plate movement before and during the Pole Shift release oil that is beneath the Caribbean? [and from another] It comes as logic that with the poleshift, one can expect strata being ripped deep into the Earth and bring up Oil gushers to the surface in a lot of places around the Earth. Am I correct in believing this? When the New Madrid fault rips as predicted by the Zetas, one can expect other rigs in the gulf to topple over and break up and bring relentless volumes of crude Oil to the surface. The pole shift will not bring greater pressure to the Gulf than it is experiencing today from the bow. Why would this be so, when magnitude 9 quakes are expected worldwide, and the N American plate will slam into the Eurasian Plate? How can a static pressure, squeezing the oil out from its beds under the Gulf, be worse than such a massive encounter? Crashing plates during the hour of the pole shift are experiencing primarily horizontal pressure, land masses thrown sideways, jerked sideways, and then allowed to bounce back. For a body of water, or a body of oil, this results in sloshing, but the pressure on the deep oil fields does not increase, overall. Unless the rock walls encasing the oil fields compress, and these are not under that type of pressure, the oil is still contained in the same volume of space. Not explosions, thus. For Iraq, which we have predicted to experience oil fields on fire, rupturing, something different will be occurring. Their beds will be ruptured not by the pressure of a plate on the move or a plate slamming into another, but because the tip of the Arabian Plate is shaped like a knife and will cut through these fields. This is visually obvious, by looking at the shape of the Arabian Plate. For N America, despite that the Seaway will rip apart and the New Madrid adjustment will involve rock from Chicago and Ohio all the way to Houston, the Gulf will not have a knife attack. Oil and gas fields directly in the line of rupture for the New Madrid could potentially rupture and burn off, however. For the Seaway, this is a stretch zone, and no increase in pressure on any oil or gas deposits there is expected. So this is now a leak about a pending leak? This is contrived, as of course they know where Julian Assange is. He is being tracked, continuously. Nor do they need to know his whereabouts to close the site down, should that be considered a national security issue. This is hype to generate interest in the Wikileaks website, which has a pending leak to post.